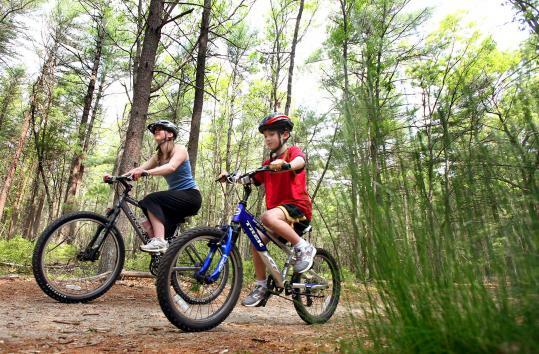 Three summers ago, a keen-eyed mother in Duxbury noticed that many children were biking and skateboarding around town without helmets on, and she wondered whether the police could do something — perhaps issue fines that might get the youngsters to take the state helmet law seriously. After conferring with police officials, a better idea was hatched: a rewards program for children who wear helmets. Instead of writing out tickets, Duxbury police hand out coupons to youngsters who are seen wearing helmets while biking, roller-blading, and skateboarding around town. Each coupon says: “Congratulations! You’ve been “caught” wearing your helmet! Thank you!” and is worth $2 toward ice cream, snacks, and other goodies at participating local shops. At the end of the summer, the redeemed coupons are entered into a raffle for bigger prizes. The helmet awareness campaign, known as RIDE PHAT, or Protect Head at All Times, is still going strong. Selden Tearse, the parent who launched the initiative, said the simple idea has been effective and could easily be replicated in other communities. Tearse, a self-described “safety freak” with two children, ages 11 and 14, said she saw the need for the program when she noticed groups of boys riding skateboards without helmets. She also saw youngsters removing their helmets when adults weren’t nearby. Helmets have been estimated to reduce head injury risk by 85 percent, according to the Insurance Institute for Highway Safety. The institute’s data show that of the 630 people who died on bicycles in the United States in 2009, 91 percent were not wearing helmets. Massachusetts law requires any person under 17 to wear a helmet while riding a bicycle, in-line skates, skateboard, scooter, or any other kind of wheeled vehicle. But there is no punishment for violating the law on the books, so enforcement is difficult. “It’s one of those unenforceable laws,” said Tearse, who believes there should be at least some consequence for violators of the law. In 2009, she began drafting an article for Duxbury Town Meeting proposing to allow police to cite children for not wearing helmets. Before it went to Town Meeting for a vote, she met the police chief at the time to get his thoughts about the proposal. Stephen Doherty, the interim police chief, didn’t like the idea, recalled Tearse. He told her he wanted his officers to have positive interactions with local youths and there were risks with chasing down youngsters who weren’t wearing helmets. What if a child fell and was injured while trying to get away? In his view, “it was a disaster waiting to happen,” said Tearse. Doherty, who is no longer with the department, told Tearse that rewarding good behavior would be more effective. That’s how the rewards program was born. Tearse and a group of parents raised the initial funding through donations. They called the initiative RIDE PHAT, by borrowing the acronym PHAT from a national skiing and snowboarding helmet advocacy program that was founded in Vermont in 2002. Duxbury police officers, along with several parent volunteers, gave out 450 coupons in the summer of 2010, and by the end of that season, 72 coupons had been redeemed at local stores and entered into the raffle. Today, the program is still going strong, and funded solely by donations from Duxbury parents. This summer, Tearse expects even more participation. She has ordered 1,000 coupons. “I’m hoping we give out all 1,000,” she said. She said it cost $35 to print the 1,000 business card-sized coupons through Vistaprint. “This program is so low-budget, and so mellow,” she said. On the back of the slip, there is space to fill in a name and phone number for the end-of-summer raffle. Each coupon is worth $2 at Benchwarmer Sub Shop, Duxbury Pizza, Farfar’s Danish Ice Cream Shop, French Memories (a cafe that sells French pastries and desserts), One Gift Coffee Shop, and Scoops ice cream parlor. The redeemed coupons are collected at the end of the season, the businesses are reimbursed, and the coupons are entered into a raffle. This year, prizes will include Red Sox tickets, New England Revolution tickets (with VIP parking), and helmets from Bern Unlimited. M.L. Nichols, one of the dozen or so parents who helped launch the effort from the beginning, volunteered to give out coupons the last two summers. She kept a stack in her car and would look out for children with helmets riding bicycles, skateboards, or scooters. “It was really fun,” said Nichols. “I think it’s a great program because you’re catching a kid doing something positive. . . . Their faces would light up knowing they had a helmet on and they were going to get” a coupon. She recalled one encounter with three children, and only two of them were wearing helmets.